Saturday, Aug. 25, 2018 11 a.m.-2 p.m.
Make your reservations now for the Ohio SPJ event of the year – the Ohio SPJ Awards Contest celebration aboard the Belle of Cincinnati. The Greater Cincinnati Pro Chapter is hosting the annual event, in association with pro chapters in Columbus and Cleveland to honor the best journalism from throughout the Buckeye State. 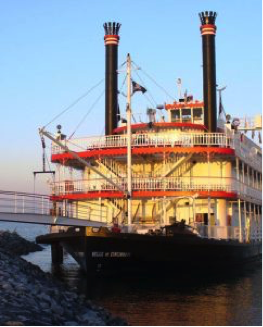 Board the Belle of Cincinnati at its home port of Newport, Kentucky, 101 Riverboat Row, from 11 a.m. until noon. We will begin our cruise along the Ohio River promptly at noon for lunch and the awards, and dock approximately two hours later. The cost is $55 per person and includes a buffet luncheon, featuring tossed mixed greens with a choice of two dressings, marinated chicken breast, pulled pork with barbecue sauce, coleslaw, green beans, baked beans, chips, cookies and brownies. Drinks are available at a full cash bar. Click here to register for the awards ceremony on Aug. 25, 2018.